We will be working with Alderman Fioretti’s office for preparation of permits for at least two additional area location dispensers after our PDNA Annual Howl-O-Ween Pet Costume Contest and Party on October 27th, 2011 at Glessner House Museum. Pamela Focia has kindly agreed to share slides of her presentation ‘Fred Anderson Park Development Plans’ given at the Greater South Loop Association Community Meeting held May 21, 2011 at the Overflow Coffee Bar. 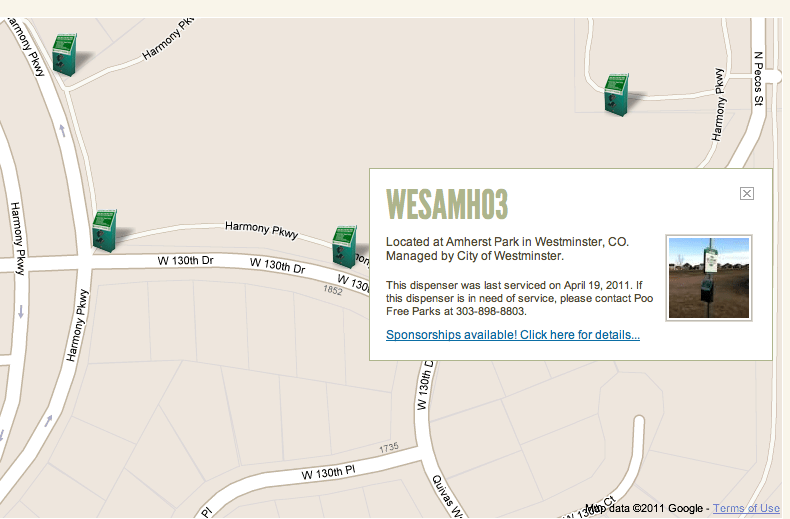 Can the CPD support Poo Free Parks? Can the Chicago Park District support Poo Free Parks? Can the City of Chicago? Poo Free Parks is a program to provide advertising-supported dog waste bag dispensers that require no city effort to support, no ‘volunteers’ to keep on top of things, and no cost to taxpayers. 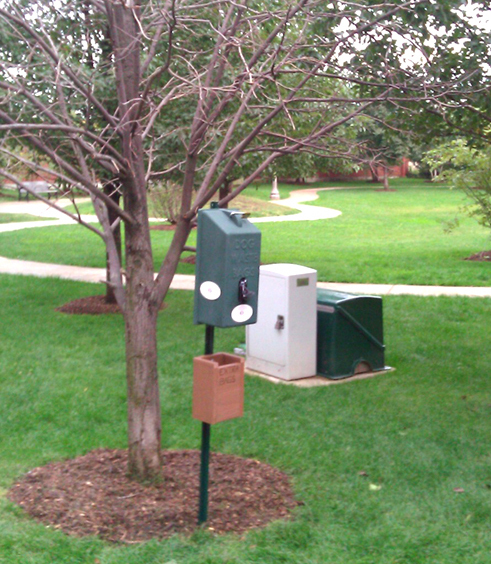 The town of Elmhurst is installing PooFreeParks dispensers this week. So will the Chicago Park District embrace this? It’s going to take a lot of effort. Please comment or contact us if you think this project is worth supporting in Chicago! 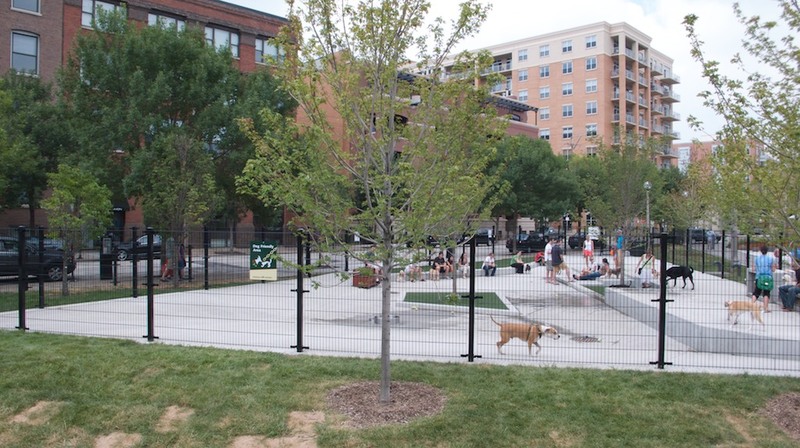 There’s a new dog park at Adams & Sangamon in the West Loop . Interesting that there’s no ‘pea gravel’ in the park, only the different concrete levels and several patches of artificial dog turf. There’s a very nice self-filling water fountain located at the center of the park (it’s obscured by the tree at the front of this picture). No poo bag dispensers yet. And there’s only one entrance, on the sidewalk at the far end in this picture. Will the dogs get used to the space? Will they take to the artificial dog grass? Will they be happy fetching in the triangular layout? The concrete levels do provide some interesting sitting space for the humans. 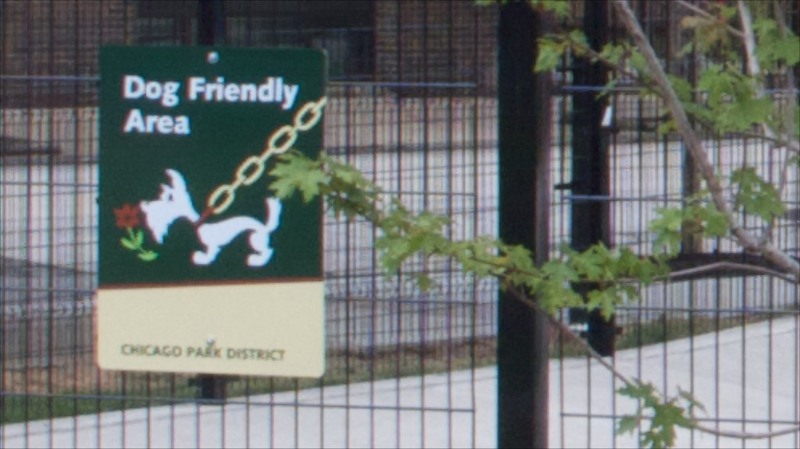 And, you can really tell it’s a dog friendly area – according to the Chicago Park District – because if you put a huge chain on your dog, then you can let her smell the flowers! 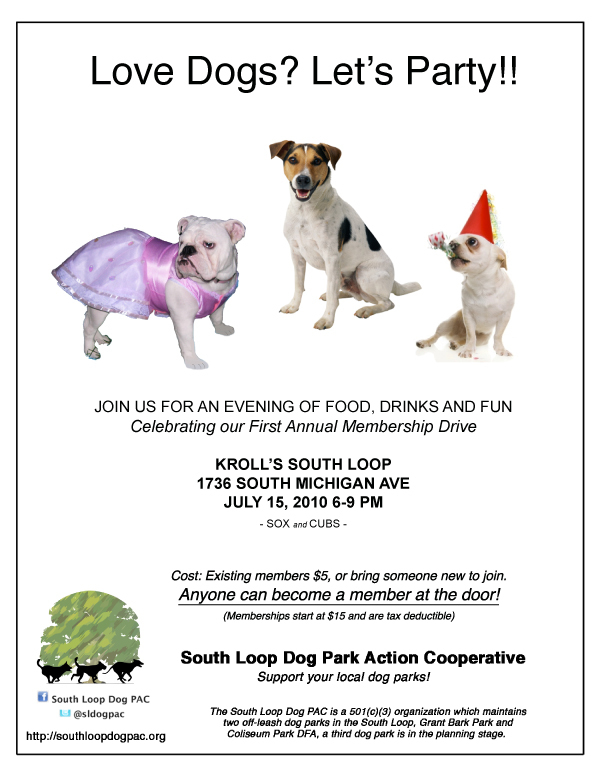 support your local dog park, party at Kroll’s! Why are Chicago DFA’s ‘hard surfaced’? The Chicago Park District requires that DFA be hard-surfaced, and states that hard surfaces prevent transmission of bacteria and viruses. But this is not some bureaucrat’s whim, and there’s a history behind the decision. For those of us concerned about the off-leash dog ares in Chicago, this is an important read. The priority issue is clearly stated: Infectious Disease Control. On page 2 of the document, the issues and concerns with various surfaces are explored, and the argument is made for requiring a hard-surface at ‘DFA’s, and for allowing a pea-gravel relief area (with some constraints). There are also some revealing compromises stated up front – particularly, that “dog guardians should ideally cross-train and exercise their dogs in various environments“. This is a document that impacts all of us as dog people in the City. The evidence and arguments supporting the ‘hard surface’ decision were provided by dog advocates, not by bureaucrats. Those of us who believe that ‘dog park as parking lot’ is a reductio ad absurdum will have to acknowledge and address the issues raised in this report if we are to propose a different direction. * The other being – Where is that dog park, anyway? Dogone Fun! Thanks for the shout-out! The May newsletter from our new business member Dogone Fun! includes a nice shout-out for the SLDogPAC. But I gotta say, we wish it only cost ” a minimum of $400 per year to maintain” the parks 😮 It’s more like $4000 + ! 🙂 And like you point out, that money does not just show up, it only comes from memberships and donations. Breaking news: Dogone Fun! 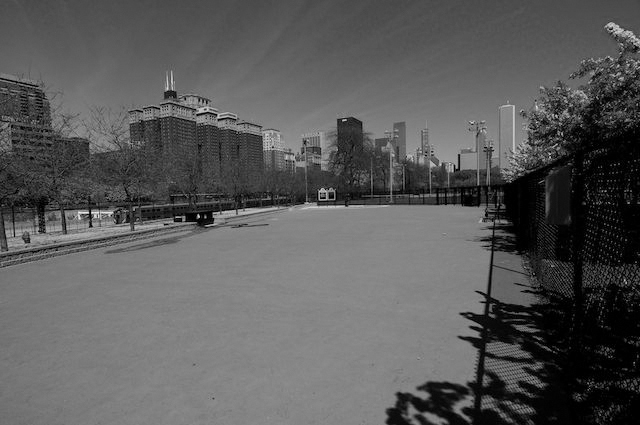 is going to participate with the South Loop Dog PAC in the Grant Bark Park Spring Cleanup on Sunday May 16th. Watch for the announcement!